The past two weeks have been filled with awesome fishing for SFM and clients. The walleye fishing has been on fire throughout the state! Fishing on the Detroit River continues to be red hot, both on the US and Canadian side. 35-48ft of water has held the more active fish. Larger fish are being found on the cleaner side of the mud line in US waters. Lime and antifreeze-colored heads with a black worm are most effective at this time. Inland lake fishing for walleye in Benzie, Leelanau, and Grand Traverse Counties has been very good. Anglers trolling after dark with floating Rapalas on lighter fluorocarbon line have had great success. Anglers targeting 5-12ft of water trolling at a speed of 1.3-1.9 are yielding good catches. 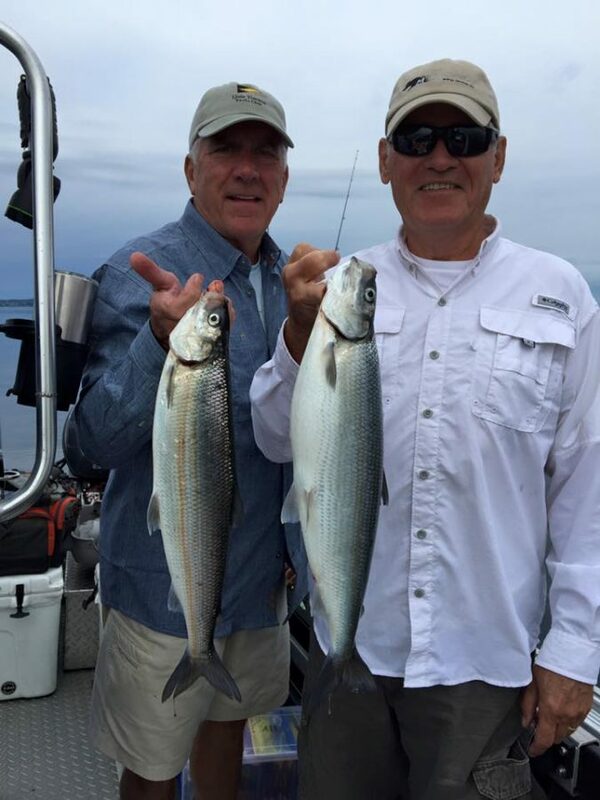 The lake trout fishing off Frankfort and East-West Grand Traverse Bay has been very red hot. 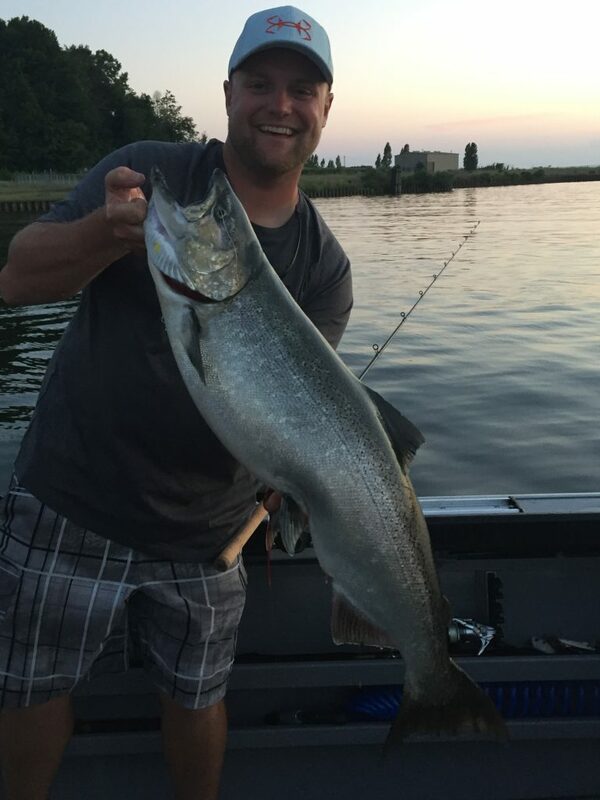 Anglers have also had frequent encounters with salmon in both locations. The most active salmon and trout have been found in 30-70ft of water, feeding on gobies and alewife in warmer temperatures. Finding the warmer water can be critical at this time of the year. Sometimes a 5-degree temperature variation can make all the difference in your catch. 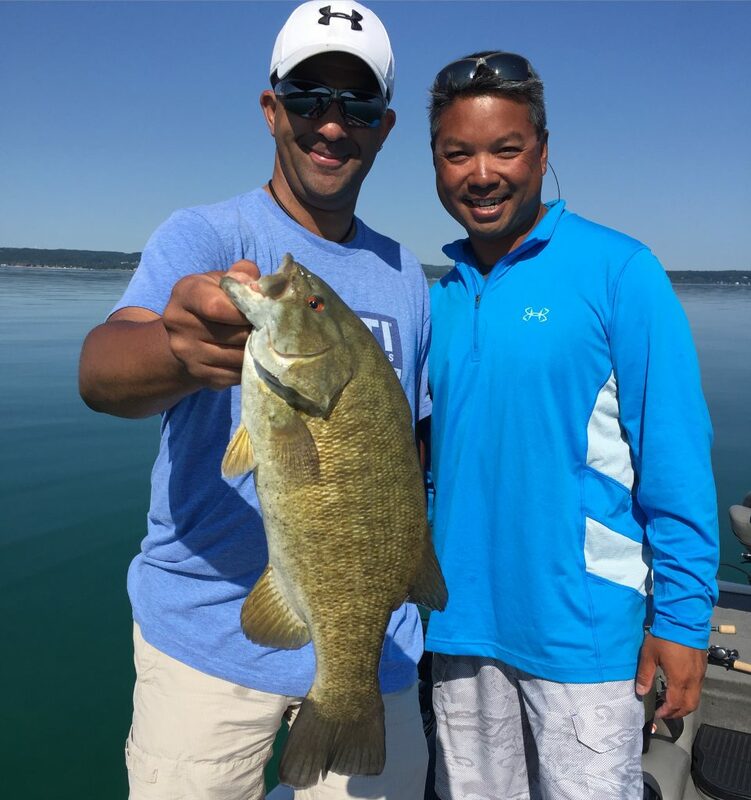 Cisco fishing on Grand Traverse Bays is really starting to heat up as well. Lots of fish are being found in 50-70ft of water close to steep drop-offs. Blade baits, jigging spoons, and trolling lead core have been working very well. Anglers trolling smaller spoons have had good action. The cisco fishing should only continue to get better through the month of May! Get out and catch some of these awesome, hard-fighting fish! With there still ice fishing to be done on many inland lakes, the annual spring steelhead run into the area’s Lake Michigan tributary rivers, as well as the open water bite for species like cisco, lake trout, burbot, brown trout and lots more, the opportunities abound for anglers here in Northern Michigan. The river fishing for steelhead pushing into the area’s rivers should be excellent if this fall’s run is any indication. While many fish held over the winter in the rivers, there should be a few nice pushes of fresh fish to target. Jigs tipped with wax worms fished under a float should tempt these frigid water chrome battlers if a spawn bag doesn’t do the trick. For fly anglers, egg patterns, leech patterns or small minnow patterns will all work. 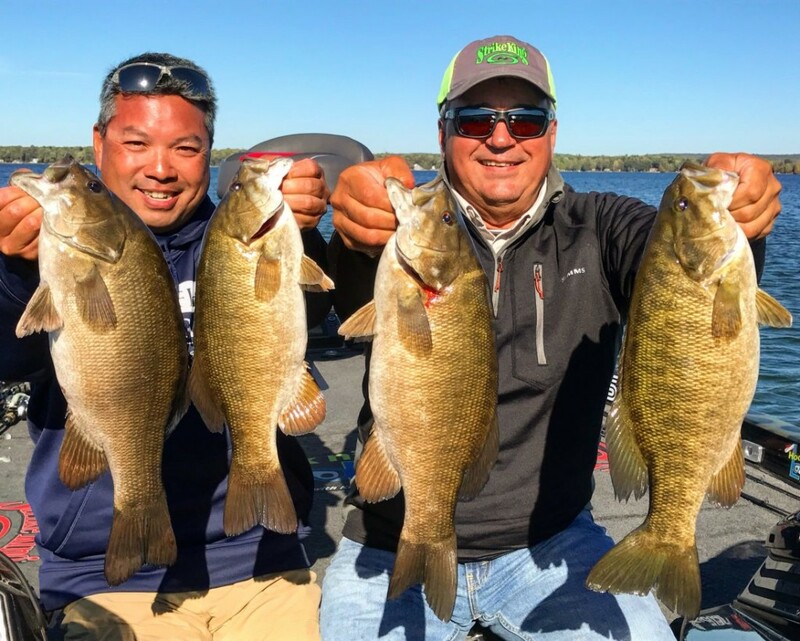 For anglers looking to get that last ice bite, the perch and the walleyes are feeding more these days with their upcoming annual spawn. Both of these species will spawn in the early spring, shortly after ice-out, and much of their pre-spawn bite window takes place under the ice. Jigging Rapalas or jigging spoons tipped with a minnow head can be deadly for cruising walleye both early or late in the day. 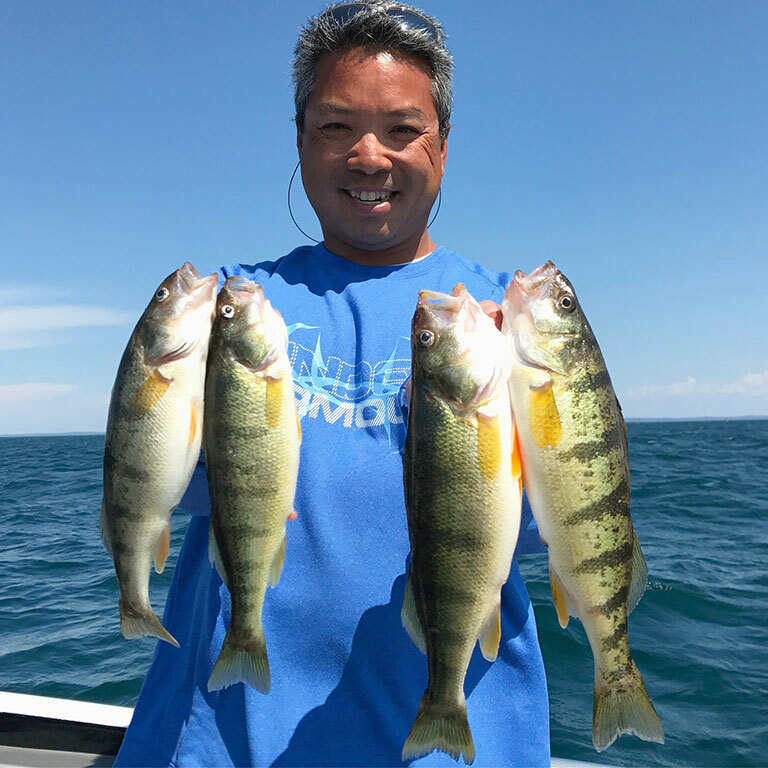 For perch anglers, minnows can often attract hungry jumbos, but sometimes downsizing to a small tungsten jig tipped with a spike or a wax worm will seal the deal. But anglers should keep in mind that as ice thaws, extra caution should be taken when venturing out. No matter how good the late ice bite can be, no fish is worth having an accident over. 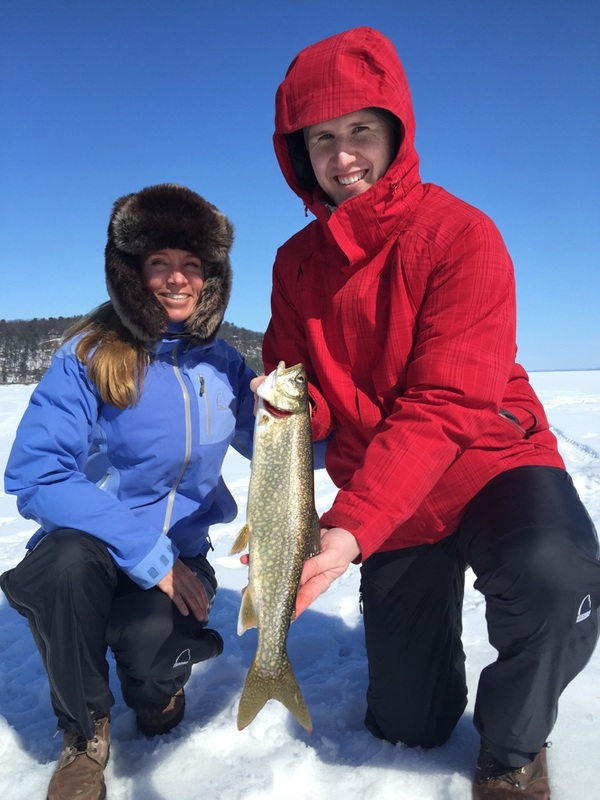 Ciscos, burbot, lake trout and whitefish all bite well during the cold water periods of March. Trolling is an excellent way to cover water, and vertical jigging is a fantastic way to stay over top of a school of fish. Trolling spoons, plugs or even vibrating blade baits can be the ticket to getting the Ciscos, lake trout and whitefish to bite. For jigging options, spoons and blade baits are the way to go. Look for schools or marks adjacent to steep breaks or depth contours like inside turns or points or humps. We here at Sport Fish Michigan are looking forward to getting back onto the water after a busy ice guiding season. While there are still ice trips to be run yet, we are anxious to get after the early ice-out fishing that can often times be dynamite. Get out and have a great time fishing, whether it’s on the last of our ice or in a boat. Take lots of care, however, since the waters are still ice cold. No matter which body of water you fish, know what technique is most enjoyable to you, have fun, stay safe, and catch some fish!